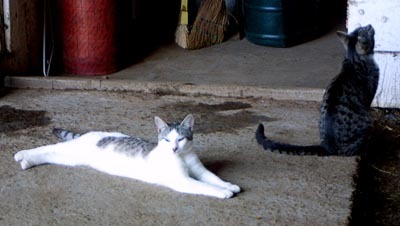 Not much going on today, these cats were having a lazy day at the stables in Waimea where I had an assignment. I’ve heard that cats need at least 16 hours/day of sleep but are sharp as tacks when awoken. I have no doubt that figure is correct as my own cat does quite a bit of napping, though she can seem pretty groggy sometimes when I try to get her awake. I’m drinking a beer to celebrate Maile’s birthday. It was today by Hawaii Standard Time, yesterday by Dalian, China time. It’s all quite confusing this time zone thing. 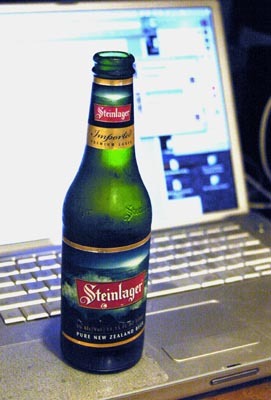 But I can’t complain, I’ve got free beer (a leftover from video night). About those two photos. The 1st photo of the cats was taken with a piece-of-crap lens owned by the company. On a sharpness scale of 1-5 it rates a 2.2 (look for the 28-80mm lens rated at 2.2), the lowest for any Canon lens. The bottle shot was taken by my personal lens which rates pretty high. Still in protest mode with the other photog and not using my own gear for company assignments. Actually I can’t help but use some of my own gear, or else I wouldn’t be able to get my job done at all. As Dennis Miller says I don’t want to go on a rant here but… we are under-equipped as newspaper photographers. Cameras that can’t take proper flash photos, lenses that pretty much break PGA tour rules when shooting golf by being too short, batteries that are dead, fuzzy lenses and no back-up equipment while in the field. I’ve spent tens of thousands of my own dollars on equipment to do my job for the company. Actually, make that for photo equipment, police scanners, cellphones, computers, software, insurance, etc. Every award I’ve won for the newspaper has been with equipment NOT owned by the newspaper. It’s infuriating at times. Serenity now, serenity now, serenity now…. Next PostNext Write On! I made the paper…I really did!